Eclipse,& full moon Aquarius-Leo. Stop-unplug-Re-initiate in Love mode! Welcome Home beloved Dear Ones! Intensity is all over, an old identity dies, we are pushed to become our best versions, and lunar eclipse, August 7th, 15 degrees Leo-Aquarius, where is this in your Natal Chart? What area, aspect, relationship, way of living, doing, loving, what inner dialogue, belief are no longer working and needs renewal ? Eclipse, the first of this month, interrupting the old mode…, stop-unplug-re-connect, re-initiate in Love mode! Understanding the consequences of how we lived, and the choices we make. We are shinning our uniqueness and creativity to redefine ourselves now. We can grow much more love here on earth. We are the love we were waiting for! You can fall in love with yourself exactly the way you are! Expand your capacity to love, feel and heal your tender heart. It is so powerful aligned to the divine! Feel the emergence of sexual vibrancy, passion and ecstatic joy. Inhabit your body, embody your light. This full moon Leo-Aquarius, is helping us to birth into our New Self. Our greatest purpose here is to know love, be love, and give and express ourselves from our love-heart center so all who are connected with us, may also know this love that we can experience, Oneness, unity consciousness. I now invite you to look with your inner eyes. Are you vibrating true love for yourself and others? Look around and inside. As you do so, consciously invite something to come to your awareness of which you were not aware. You allow all of that to wash over you and you feel even greater awareness of your own self. Let´s exercise with some TotalSoulGym! -Ask for a column of loving Light, now and everyday, to nurture yourself .To activate your Body of Light. Visualize it, feel it.You are Light, remember! -Be there, present, receive, info, Light and Divine Love to transform, to heal now. Awake. Elevate your vibration with your love and the divine energies assisting you. Open your mind and your heart, decree your intention of loving yourself as much as you can. -Affirm your Intention of this. Feel it with your mind, your Heart and your gut center. 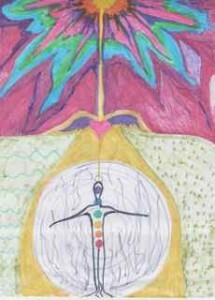 -Connect to Mother Earth now, developing strong routes to her center. -Now breathe in and breathe out, letting go energies that no longer work for you. -Receive everything you feel, embrace your old and present emotions in your hearts, receive this info your body is giving to you. Just feeling, accepting how and what you feel will transform you. Don´t stop using the breathing to release and open more space inside. To rebirth and re-initiate. -Feel your chest, heart center. Land there, this is your true base. -Activate, invoice, invoke your Divinity, feel the meeting…join the divine love , unite with Earth and Heaven in your heart.Breathe. Allow this magic to elevate your frequency, your vibration, to attract what you deserve and long for. This is what assists you in finding a greater balance for yourself in your life. Sometimes in your everyday life when you are having physical symptoms it is because you need to re-connect and grow more love for yourself inside in that aspect/organ/energy/area of life/. Breathe in deeply. Feel yourself as you’ve become this light body energy or this crystalline energy that you are. Feeling into the stillness. Breathing in solitude. Letting go. Letting go again. Receiving the love in your wounds and pains. Wondering who you are now. What’s required is trusting, opening, attracting, allowing, softening, intuiting, listening, quieting, feeling, loving, and learning to embrace freedom, pleasure, uniqueness and the joy of life. Your Divine Presence is here, within you and will awaken as you wish it too… to enlighten your world here. Previous post: Coming back Home, I am my source of love-Full moon! Next post: luna llena con eclipse, tiempo de brillar mi amor!